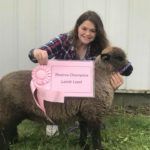 The Babydoll Southdown Sheep Breeders Association & registry (BSSBA) is happy to announce we will be hosting the 2018 Regional Babydoll Southdown Sheep Show on September 8th -9th during the Garden State Sheep Breeders Sheep & Fiber Festival at Hunterdon County Fairgrounds (1207 NJ Route 179 Lambertville NJ 08530). Please plan to attend and enjoy the shows, exhibits, vendors, demonstrations, and of course meet your fellow BSSBA members. BSSBA will sponsor the trophies for the show. All premiums will be paid through the Garden State Sheep Breeders. Premiums and ribbons will be awarded for first through sixth place in Classes 1 through 11 (ribbons only for Classes 12 through 18). The premiums are the same as the GSSB Sheep Shows: 1st place – $25; 2nd place – $20; 3rd place – $15; 4th place – $10; 5th place – $8; and 6th place – $5. Champion and reserve rosettes will also be given. Premiums will be mailed. Thanks and we look forward to seeing you in September! Premiums are paid for Classes: 1, 3, 5, 7, 9 and 11 Only. Open Sheep Shows will take place on both Saturday and Sunday. For more detailed information about the shows or show schedule, contact Reni at stonemanorfarm@gmail.com. This is an off-the-truck show. There will be sufficient pens at ringside for shows in progress, but you must remove your animals from those pens when you are finished with your show to allow others to use them. Any remaining pens will be available on a first come first serve basis with a 3 pen limit per farm. No bedding will be provided. There will be pen managers in the barn to help you find space. We strongly recommend that you bring your own pens so the safety of your animals is guaranteed. Set up of your own pens will be in designated areas. Please follow the signs to the Exhibitor’s Entrance to the Vet Check before unloading animals. Thank you for your cooperation. 1. Sheep must be checked-in by 9:00 AM the day of their show. Veterinary check-in will be available at the Exhibitor’s Entrance Friday 1-7 PM, Saturday 7-10 AM, Sunday 8-10 AM. You will receive a tag to display on your pen as proof that your animals have been inspected. 2. The entry fee is $5 per sheep per show up to the Friday of the week before the show (Aug. 31, 2018). You may pay by check or via PayPal. Entries can not be accepted once the Festival has begun. A sheep must be shown in an individual class to enter in the pair or group classes. There is no charge for the pair or group classes. Questions about receipt of registration/ payment should be directed to Joan Schnieber 908-319-0382 or jennyjumpfarm@gmail.com. 3. Premiums and ribbons will be awarded for first through sixth place in Classes 1 through 11 (ribbons only for Classes 12 through 18). The premiums are as follows: 1st place – $25 ; 2nd place – $20 ; 3rd place – $15 ; 4th place – $10 ; 5th place – $8 ; and 6th place – $5. Champion and reserve rosettes will also be given. Premiums will be mailed. 4. Exhibitors may show up to 4 sheep per class. 5. Any breed having 4 breeders and 20 sheep will be given their own show. Breed show will be determined on the basis of entries received. 6. All animals must be free from infectious and contagious diseases. Sheep must be accompanied by a Health Certificate dated within 90 days of the festival for NJ residents and 30 days for out-of-state participants. RABIES SHOTS ARE REQUIRED FOR THIS YEAR’S SHOW. In addition, animals will be inspected by a veterinarian at the show grounds. 7. Because of the Scrapie program, all sheep must be tagged with official identification. 8. Bring your own pens, bedding, hay, buckets, feed and halters. 9. Sheep are released after their show. Apologies….Pay Pal limitation – only 10 choices per dropdown are allowed.